Because rules ruin fun and Porsche’s Le Mans prototype group doesn’t have to adhere to rules anymore, the company took one of its Le Mans racers out to Spa-Francorchamps. But the car went out there unrestricted, not a care in the world about series rules, and lapped the circuit faster than a Formula One car. This is all part of a “919 Tribute” world tour Porsche will go on to honor the Le Mans legacy it decided to end after the 2017 season, and also probably to smash every lap record it can find. Consider that done as far as the Spa visit goes. Even though the company quit the FIA World Endurance Championship’s top Le Mans Prototype 1 class at the end of last season for the all-electric Formula E, Porsche’s still out there making everyone else look slow. 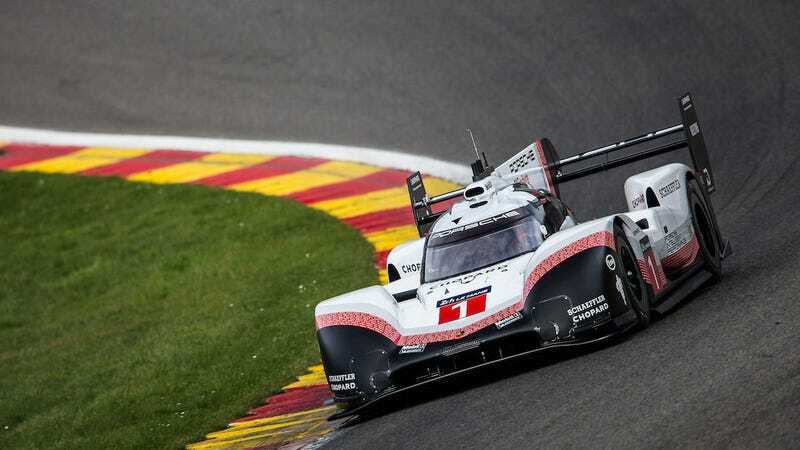 Porsche announced Monday that its Le Mans-winning Porsche 919 Hybrid set a new record at the track that hosts the Belgian Grand Prix, running the 4.4-mile circuit in 1:41.77 minutes and beating Lewis Hamilton’s record in an F1 car by nearly a second. Footage of the car made it on YouTube Sunday, wailing around Spa so quickly that you might have to rewind just for your brain to process what happened. But since Porsche said the lap record happened on Monday, it’s probably safe to say that this video was of a practice or test run for the big day. The Porsche 919 Hybrid ran a 1:53.7 fast lap the WEC Spa race in 2017, which it qualified on pole for. But the race car was a lot different when it went to Spa this time—Porsche used the 2017 championship car along with developments that it would’ve used in the 2018 season, and also made aerodynamic, suspension and power-steering modifications. The WEC efficiency regulations limited the energy from fuel per lap by using a fuel flow meter. At the 2017 championship round in Spa, in the Porsche 919 Hybrid’s final season, it could use 1.784 kilogram/2.464 litres of petrol per lap. The V4 combustion engine’s output back then was around 500 HP. Freed from these restrictions, equipped with an updated software but running the regular race fuel (E20, containing 20 per cent bio ethanol), the 919 Hybrid Evo delivers 720 HP. Compared to the car in race trim, the dry weight was reduced by 39 kilograms to 849 kilograms. To achieve this, everything was removed what isn’t needed for a single fast lap: air-conditioning, windscreen wiper, several sensors, electronic devices from race control, lights systems and the pneumatic jack system. Conveniently, Porsche took its unrestricted 919 Hybrid out to Spa a few weeks before WEC will race there. The 919 Hybrid will be at the Nürburgring in May next, then the Goodwood Festival of Speed, the Festival of Porsche and the Porsche Rennsport Reunion, probably getting faster as it goes. Break those rules, Porsche. We missed having to do a double take as your blur of a Le Mans prototype whooshed by us on the race track.